A favorite among those who prefer a larger-size writing instrument, the Sailor King of Pen Black Ebonite with gold trim is a study in streamlined style and simplicity. Handcrafted ebonite hard rubber and Sailor 21k nibs combine to create a unique and starkly beautiful pen. 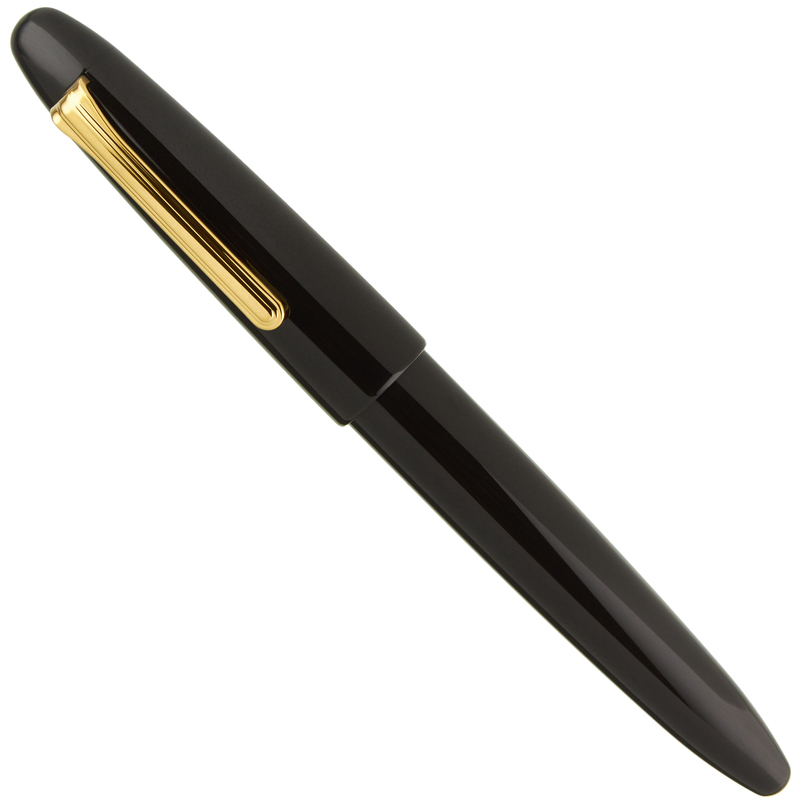 The Sailor King of Pen Black Ebonite with Gold Trim fountain pen is handcrafted from high-quality ebonite. Part of Sailor's exclusive Bespoke Collection, this pen is provided standard with your choice of 21k solid gold King of Pen nib. Sailor's smooth-writing 21k nibs offer a writing experience unique to this brand. The King of Pen nib has a subtle springiness which provides a different feel on the page than the more rigid nib used in the 1911 Full Size and Pro Gear series pens. Ebonite hard rubber is a classic material for quality fountain pens. The surface is polished to provide a subtle gleam. This writing instrument can be filled with bottled fountain pen ink using the provided converter, and can also use convenient Sailor brand ink cartridges. Each King of Pen Black Ebonite pen is handcrafted in Japan, and production times can vary from six months to a year or more. While we always attempt to keep this pen in stock, demand can often exceed supply and we strongly recommend pre-ordering when necessary - you will not be charged until your pen arrives and is ready to ship to you. 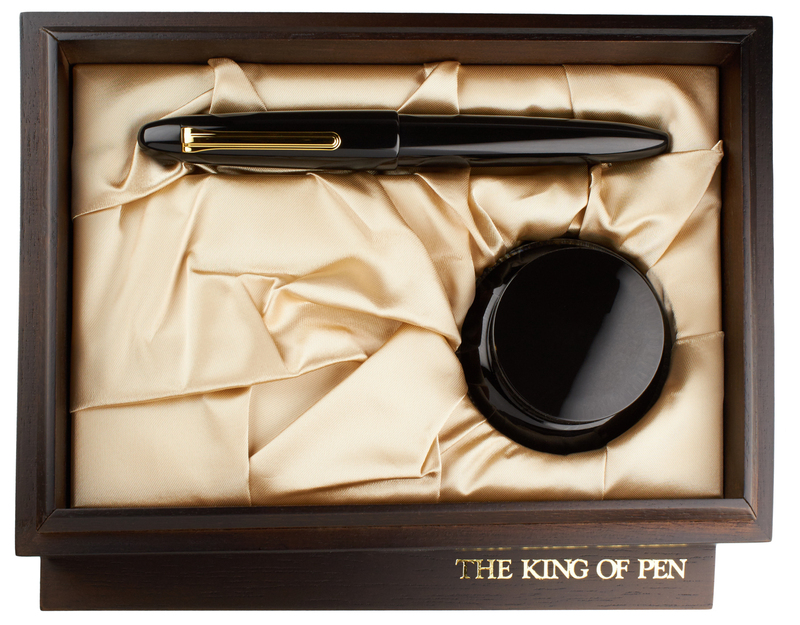 The King of Pen ships in a dark wood presentation box which includes all papers, a converter, starter ink cartridges, a polishing cloth, and a bottle of Sailor ink.